Well this was disappointing. Seriously disappointing. 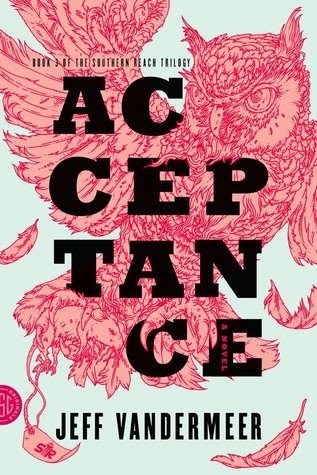 The Southern Reach trilogy started out promisingly enough in Annhilation, but there were signs of trouble even then. Jeff Vandermeer began spinning a wickedly creative story about an expedition into the heart of a mysterious, possibly alien wilderness that had completely overtaken a portion of the coastline and separated itself from the rest of the world. I compared it to the first season of Lost (which I loved, for the record), but wondered if like Lost it would eventually begin drowning in its own mythology and refusal to provide answers. Disappointingly, that is exactly what happened in Authority, the second part of the trilogy. Vandermeer changed up the setting that time, putting us at the heart of the Southern Reach, the organization responsible for the expeditions into Area X. But instead of revealing much of anything about what went down in the first book (or even peeling away a few layers), things only got crazier. Vandermeer was so enamored of the mythology he was creating that it all began to get overhwelming. I became worried that all of this … stuff was ultimately leading nowhere. There would be no payoff, no big reveal, no satisfaction for bearing with all the mystery for three books. And once again, I was disappointingly correct. It turns out that Vandermeer never wanted or cared about getting to the heart of what has been going on in Area X (or in the Southern Reach, for that matter). In fact, Vandermeer frequently tries to enhance the mystery by distracting you. These increasingly desperate attempts at misdirection get more obvious and more annoying each time. It reaches the point where something incredibly bizarre will happen to someone, only for that character to actively avoid thinking about what just happened. Ostensibly this is because they can’t process what is going on around them, but the truth is that if Vandermeer allowed them to pursue the clues we might actually have to arrive at a conclusion (or start dispensing some of those answers Vandermeer disdains so much). It also only serves to make his characters frustrating to no end. What the Southern Reach ultimately centers on isn’t a mystery, nor a mythology or an adventure–it’s nothing more than a serious of deliberate obfuscations. That gets old pretty darned quickly. Look, I’m not saying you need to wrap everything up in a neat little bow in order for a book to be satisfying. That would be patently untrue. It’s the execution of the Southern Reach trilogy that ruins it in the end. It’s deliberately unsatisfying in every way, and it only gets worse as the series goes on.